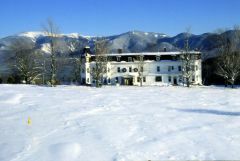 Spectacular mountain views from every room combine with polished lodging and dining to distinguish Sunset Hill House as a fine New Hampshire Bed & Breakfast Inn. Award winning dining - a Chaine des Rotisseurs property, Wine Spectator award, several "Best of NH" awards. Best Views in New England -- according to numerous sources from 1880 to present. Breakfast is an event at sunset, and our famous 3-course breakfast is included in your stay. Begin with fresh fruit, a pastry baked that morning and order off our seasonal menu. Coffee and tea are bottomless cup. When youre done for the day, come dine. Executive Chef Joe Peterson, will ensure your satisfaction. Chef Peterson has been featured in Bon Appetit, Gourmet and other national publications, and in a recent article was named one of the stars of the inn. We offer 28 guest rooms and suites, full dining in both our formal dining rooms and in our tavern, and extensive meeting facilities. Enjoy our library (with books for trading), formal parlor (if you can play the piano, wed love to listen! ), and TV/game room. Every guest room has an unobstructed mountain view. Those facing east look onto the spectacular and rugged White Mountains, anchored by Mount Washington. In winter you can see the skiers at Cannon Mountain. Rooms facing west look over the golf course onto Vermonts fabled rolling Green Mountains. Some rooms are furnished with antiques from the original Sunset Hill House. Some have gas fireplaces, or double Whirlpool tubs, or a private deck, or all of these! Exit 38. At bottom of ramp, turn left, cross under the highway and turn right onto Rte. 18. Go 1/4 mile and turn left onto route 112. Go up hill 2 miles and turn left onto Sunset Hill Road. We are 1/4 mile on the left. Exit 17 to Rte. 302 east, proceed approx. 18 miles to Rte. 117, drive to the top of Sugar Hill, turn right on Sunset Hill Rd.